In Nicodemus, Kansas, there are no mountains, oceans, or canyons. Nicodemus was not a great battlefield, it holds no renowned architecture, and none of our presidents was born here. Were one to consider it only for its physical attributes, Nicodemus might seem entirely unremarkable. 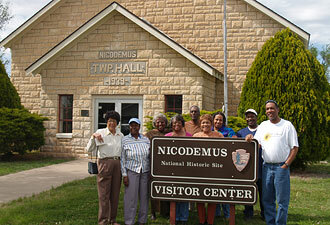 Yet as the first and only remaining black settlement in the West, Nicodemus is very remarkable. In the years following the Civil War, as America grappled with the issue of Southern reconstruction, blacks found themselves in American society but not integrated. The joys of emancipation were often marred by the senseless violence of Klu Klux Klans and the oppression of Jim Crow laws. In April 1877, W. R. Hill, a white man, traveled to Kentucky to promote the creation of an all-black town in the Solomon Valley of Kansas. In Southern and border states, a person's view about Kansas was often a matter of perspective. Confederate sympathizers considered it a divisive hotbed that sparked the urgency for secession, but to former slaves, Kansas was the home of whites who had fought for their freedom. It was in Kansas that John Brown demonstrated his preference for action over words by initiating America's first battle between Free State and pro-slavery forces, and Kansas had been the first in the Union to enlist African Americans in military service. In this context, the idyllic vision elicited by Hill, of rich farmland in Kansas and the potential for a life free from oppression, was indeed an attractive proposition. By July of 1877, more than 300 people had joined the Nicodemus Township Company. The first settlers arrived in September of that year. During the first few months the settlers lacked traditional building materials, so they lived out of holes in the ground or in houses constructed of sod. Food was scarce. Life was difficult. But, for men like the Rev. Roundtree, who spent 45 years in slavery and was sold eight times, the hardships of life on the prairie did not compare to the scars of the past. Over time, the town grew and businesses sprung up. Early on there were several whites living in Nicodemus and by the late 1880s the town had a fully integrated school. Dr. J. E. Porter, the school's black principal, noted that, “The school was mixed. It was my first experience in teaching a mixed school. There was no friction; but perfect good feeling at all times.” Educational integration would not occur on a national level until after the U.S. Supreme Court's 1954 ruling on Brown v. Board of Education of Topeka, Kansas. Today, descendants of the original settlers still live in and around Nicodemus. Because the story continues to unfold, staff at Nicodemus National Historic Site interprets a living history of the town and works closely with private owners of historic properties. Visitors to Nicodemus can explore the town site, view displays in our visitor center, and watch an interpretive film that features perspectives of Nicodemus residents. Throughout the year Nicodemus National Historic Site hosts a variety of special programs, musical events, and youth activities. 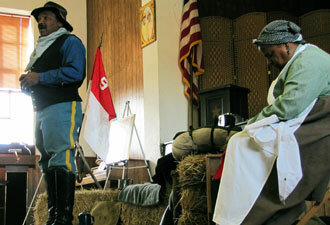 Every July, Nicodemus hosts the annual Emancipation Celebration. The event doubles as a homecoming for descendants and features a parade, food vendors, buffalo soldier reenactments, a dance, baseball games, and many other activities. 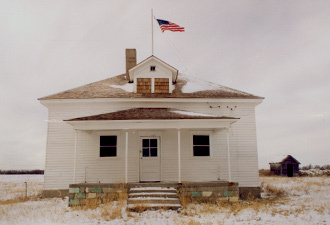 Nicodemus National Historic Site, off Highway 24 in northwestern Kansas, is open daily except for Thanksgiving, Christmas, and New Year's Day. Stop at the visitor center for warm welcome and great ideas to get the most out of your visit.